Spring is a welcomed awakening after a sometimes daunting and seemingly endless state of hibernation, so it makes sense that spring is also prime baby shower season. But for expectant moms who will welcome a new bundle of joy during the winter months, planning a festive party can come with its own unique set of challenges and accommodations. For moms-to-be whose due dates are more synonymous with snow and cold than the warm rebirth of spring, here is a quick guide and simple ideas that will help you make the most of a winter baby shower — no matter how cold it is outside. Before planning anything, it is wise to first set a budget, and then to decide who will ultimately be responsible for the bill. 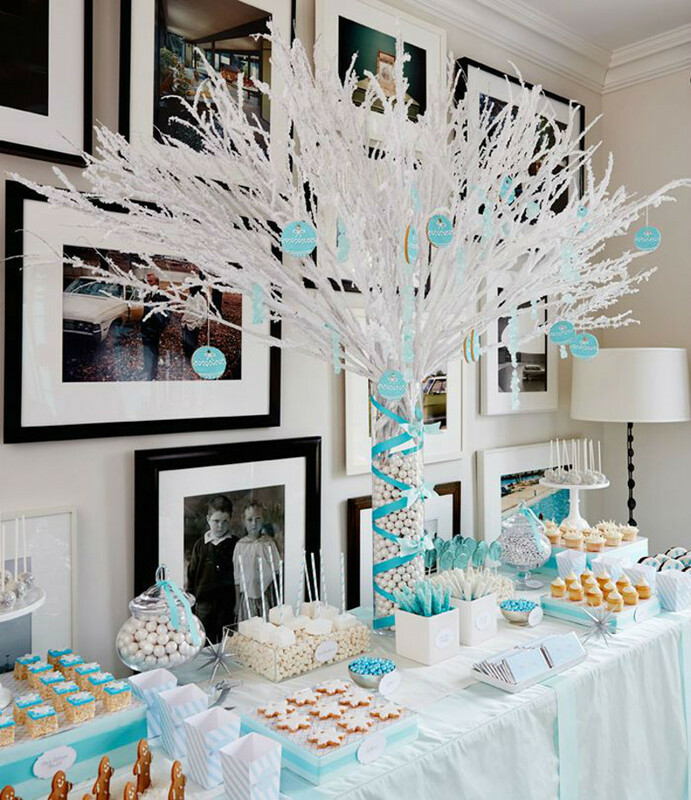 The baby shower could be the host’s gift to the parents-to-be, or funds can be pooled among close friends and family members. Many spring and summer baby showers are held outdoors, with smaller gatherings taking place in someone’s backyard, or a park to accommodate a larger number of guests. But the great outdoors is no place for a winter baby shower, limiting the number of available and appropriate locations for your event. If there will be 15 guests or less, the host’s, expectant parent’s, or a family member’s home should provide enough room for everyone to fit and maneuver around comfortably in a relaxed environment. For a larger crowd, as we mentioned above, you can rent a hall, space at the honoree’s favorite restaurant, or even a board or business room at a local hotel. You should be able to rent a space at any location that usually hosts events, so don’t be afraid to look around and price check according to your budget. The traditional hatching chicks of spring might not be the best fit for a winter baby shower, but that doesn’t mean that you can’t create a lovely and fun party atmosphere. Keeping in mind the tastes of the expectant mother, the shower theme can be traditional, modern, or a mixture of both. To evoke the spirit of the season, try incorporating traditional pastels with brown or gray to mimic the natural winter color palette. For a more sophisticated look, try a blue color palette with silver accents, or even an all-white color scheme with glitter accents that will remind guests of fresh falling snow. The first step to planning the perfect baby shower menu is to ask the honoree what food(s) she is craving most these days and make those dishes the focal point of your menu. Round out the edible offerings with a selection of finger foods. You may also consider making it a potluck affair so that you won’t be taking on the entire menu by yourself. This will also ensure that any picky eaters in attendance won’t feel like “that person” who brings their own food to a party, and everyone who brings a dish is guaranteed to like at least one thing on the table. To make things easier on yourself for the dishes you will be making yourself, try to choose dishes that can be made ahead of time and frozen, or can at least be made a day or two in advance. If you will be ordering a specialty cake or cupcakes from a bakery, place your order one month in advance of the event. If the parents-to-be haven’t found out the gender of their baby, or just aren’t telling, unisex baby shower gifts like a diaper cake, wipes, bottles, onesies, and security blankets will always be used. To accommodate the gifts, decorate a table with linens and decor items that match your shower’s theme and place it as close to the party entrance as possible. This will save the honoree or host from the hassle of having gifts thrust at them whenever a guest arrives and having to walk each gift over to the gift table themselves. Designate someone to help the honoree with recording the gifts they receive and who it came from. This will help tremendously when it comes time to write thank you cards with sincerity and thoughtfulness for the people who helped share in the excitement of welcoming the new baby into the world. For a fun winter baby shower activity, buy plain white cotton baby hats and onesies and provide a variety of safe materials to decorate them. Guests will enjoy creating cute items for the new baby, and mom can show them off once baby arrives. Every new mother needs a little advice, encouragement, or just a good laugh to get them through. Provide guests with pieces of paper or pre-cut stationary that matches your shower theme, like snowflakes, mittens, or baby booties, and have guests write down their most valuable pieces of motherly advice. Place all of the pieces of paper into a vase or jar and put it in the nursery so that the new mama can read through them when she needs to. You can also give traditional games like “Don’t Say Baby” a wintery twist by having guests wear a snowflake pin and if someone says “baby,” they have to give their snowflake pin to the person who caught them. The party-goer with the most snowflake pins at the end of the shower will win a festive prize or favor. It has been SO long since I planned a baby shower. My babies are teens and most of my friends have had their kiddos and have at least toddlers. I love this step by step! I love baby showers. Great ideas for winter babies. I don’t know how long it’s been since my last baby shower. Although there won’t be any time soon, it’s always nice to attend these parties. Those are pretty good tips!